After losing an Uwatec D-Timer on the wreck of the Hood in Weymouth, I am sadly all too aware that an essential component of any wrist-mounted diving instrument is an efficient strap. When it comes to watch-style dive computers, the norm seems to either be rubberised or metal straps, and this was the case with Suunto D6 watch computer range. Divers had a choice of two strap finishes: a metal bracelet style strap in stainless steel or titanium or a vividly coloured silky soft silicone strap. Personally I love the way Suunto has embraced such gaudy gorgeous colours. However divers have been asking for an alternative option, with the result that Suunto has now launched an extremely durable army-style textile 'Zulu' strap based on the popular NATO strap. "We wanted to address the requests from spear fishers, free divers and dive instructors." The NATO strap was originally called the G10 - it was named after the requisition form number - and developed for the British Army in the 1970s. The design concept was not a new one, and, in fact, it is possible to trace similar designs back to WWII. The design was popular with the military because the single-piece construction design provided a secure fitting. If you think about it, pretty much every other strap comprises of two separate pieces attached to the spring bars on the watch. This is not the case with the NATO strap. You simply weave the strap underneath the spring bars, allowing the user to fit this strap in seconds. This process ensures that in the event that one of the spring bars becomes loose or snaps, the watch case will remain firmly on you wrist. And it works! I lost a watch pin on my first dive watch. The strap kept the watch case secure. All of these characteristics make a Zulu or NATO strap an excellent choice for nearly any situation. It is easy to adjust for wearing over a wetsuit and is comfortable and stylish for daily use. And the low price is a boon to those on a budget. Suunto state that this strap can be retro fitted to the D6 range. Colours: Black, Stealth (i.e. drab olive) and Blue. The blue option is available for dive instructors and dive masters only. 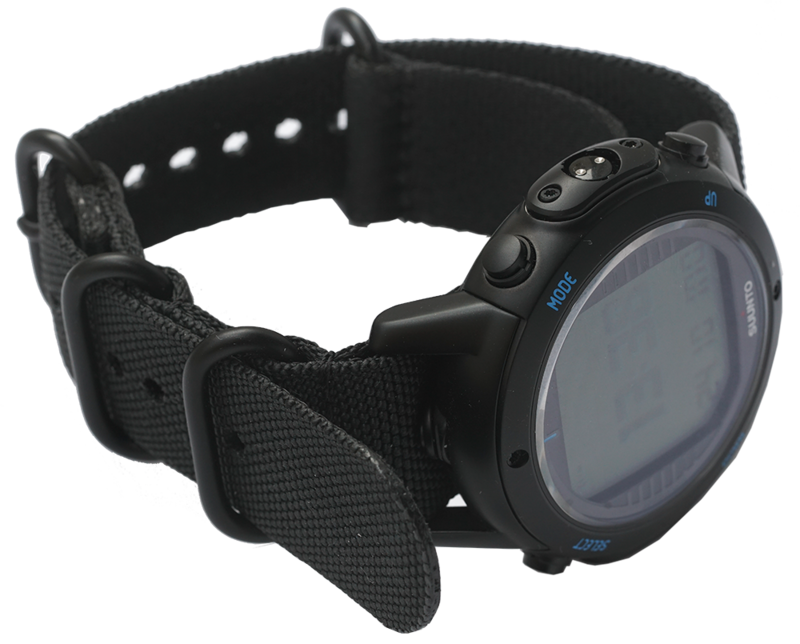 Divers will need to prove their diving status with their local Suunto office to secure a blue strap.